This month, a California appeals court restored the state’s teacher tenure laws, which had been ruled unconstitutional by a lower court two years ago. But the ruling was hardly a ringing endorsement of California’s approach to tenure. Here’s what’s not in dispute in the case, Vergara v. California, even after the appeals court’s decision: Thousands of teachers in schools across California — a small percentage but still a huge number — are not up to the job. These grossly ineffective teachers are derailing their students’ academic futures. Poor and minority students are more likely than others to be assigned to one of these teachers. And all of this is happening because of state laws that make it practically impossible for schools to replace the relatively few teachers who shouldn’t be there. The appeals court justices challenged none of these facts. Instead, they overturned the verdict based on the most technical of legal technicalities. They decided that the tens of thousands of “unlucky” students assigned to ineffective teachers aren’t a group that deserves any special legal protection. As for poor and minority students being disproportionately taught by ineffective teachers — the court decided that’s not a violation either, arguing that local school systems could remedy the situation in spite of the law. • Related commentary: Dmitri Mehlhorn surveys the ruling’s fine print and identifies three key arguments that may sway California’s Supreme Court. The court doesn’t elaborate on how local officials might do that, though, because there are no plausible explanations. 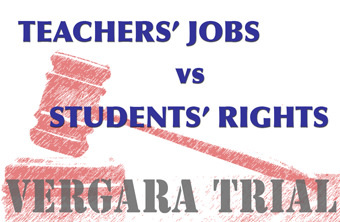 Schools could fire their ineffective teachers, but the court admits this is nearly impossible under the law. Alternatively, schools could spread the harm around by assigning ineffective teachers to classrooms with affluent white students — hardly anyone’s idea of a “solution,” and something that no district has ever actually done. Still, according to the appeals court, the theoretical possibility that a district might be able to circumvent all evidence and experience is enough to absolve state laws of the actual damage they’re doing to students. That means we’re left with a situation where the justice system has acknowledged that California’s tenure laws are robbing tens of thousands of students each year of the education they deserve, but claims the state has no obligation to fix the problem. Of course, the state legislature could always choose to fix the problem anyway. As my organization explained in a 2014 report, Rebalancing Teacher Tenure, improving tenure laws doesn’t mean stripping teachers of all their job protections, or ignoring other pressing educational issues like teacher shortages. It simply means making a few common sense changes that strike a better balance between the interests of teachers and the educational rights of students. But history suggests that even when faced with hard proof that tenure laws are hurting students, and even when armed with clear solutions, lawmakers are too captive to special interest groups to take meaningful action. It’s why students and parents asked the courts to intervene on the issue in the first place. If the overwhelming evidence presented at the Vergara trial wasn’t enough to inspire a serious effort to fix these laws, it’s hard to imagine what would. That evidence isn’t going away, though. No amount of tortured legal reasoning can sweep it back under the rug. If anything, the mountain of evidence will keep growing, as challenges to similar laws in New York and Minnesota wind their way through courts there. The indisputable fact is this: Every day that California’s tenure laws remain unchanged, the state knowingly subjects kids to bad teaching that hurts them in life-altering ways. As things stand now, not a single branch of California’s government is willing to step in to address this profound injustice. Let’s hope a higher court ensures that’s not the final answer to Beatriz Vergara, her fellow students and families across the state. Let’s hope that they won’t have to wait much longer for the justice they are so courageously demanding. Daniel Weisberg is chief executive officer of TNTP, an education nonprofit that helps school systems across the country end educational inequality and achieve their goals for students.